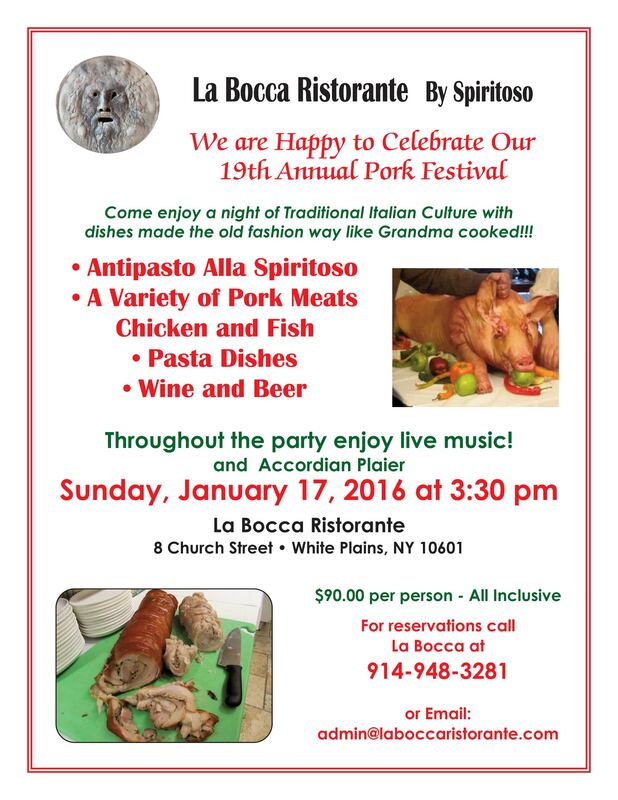 Join us for our Annual Pork Festival! The event returns, organized once again by La Bocca and his chef/owner Tony Spiritoso, to resume and bring attention to feelings, tastes and smells that are part of the local traditions. The pig, the animal to use everything, which, in the days when the meat was more than a luxury, "do not throw anything away", resumes, for a day, his role of "main product" of the boards of our area in Calabria and in the all south of Italy. The slaughtering of the pig, in fact, held in mid-winter (then better preserve the meat) is a moment of great celebration for many folks from Calabria. To pass on the tradition, the meat of the pig will be prepared as a time and of course served barbecued or in the form of sausages. It will be served all products made from pork: sausage, bacon, pasta dishes and typical side dishes. Of course, all washed down with red wine in a setting of pure fun that will accompany the evening through folk dances, music, and much more! You can't miss it!